As shown in the picture at the head of this column, this room was evidently a very pleasant one, and quite as adequately furnished for its purposes as any hospital room would be. The old minute book records that this was done under the direction of Mrs. Robert G. Wilson, who contributed the hospital bed and bedside table, large cupboard, chairs and small gas stove. All this is particularly interesting in view of the fact that, with all of the emphasis placed on first aid during the second World War, there was still no attempt at this later period to establish such a room for a local emergency. Incidentally, this emergency room had no connection with the first aid classroom of World War I. 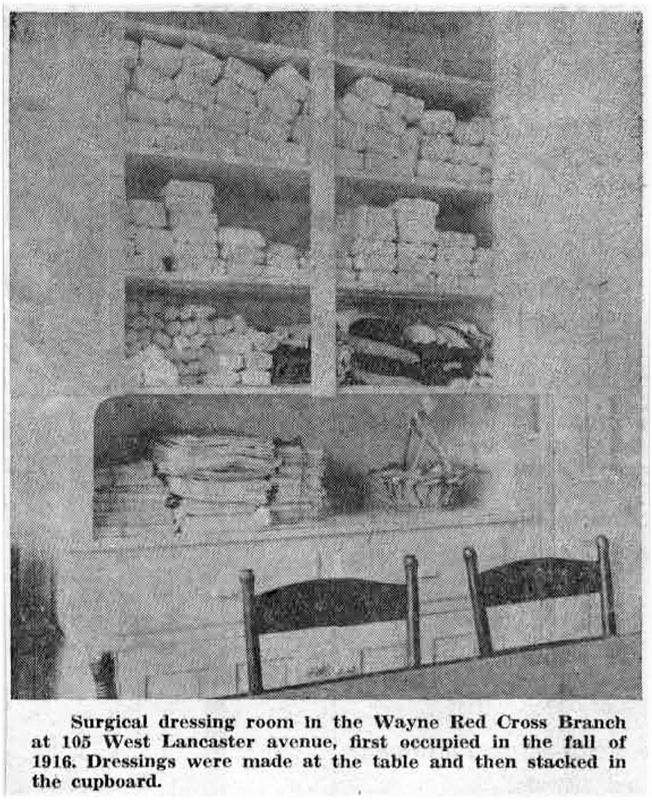 Highlights of the activities of the Wayne Red Cross Branch in its very early days have been listed in a brochure, material for which was assembled by Miss Grace Roberts for the opening of the present Red Cross headquarters Party in November, 1941. Among the outstanding accomplishments of the 1915-17 period were the endowment of a bed, in 1917, in the American Ambulance Hospital in Paris, in the name of the Wayne Branch. There was the presentation of an ambulance for use at the front lines at about this same time. The very first gift of money from the Branch went to Queen Elizabeth of Belgium, for Christmas presents for destitute children in that country, in December, 1916. The Branch’s first gift box went to Soissons, France, packed with knitted garments, surgical dressings and comfort pillows, and, not to forget those Americans who were defending our own borders, many blankets were sent to soldiers stationed on the Mexican border. This lists but a few of the accomplishments of a rapidly growing group, organized in 1916 for wartime relief. Soon auxiliaries supplemented the work of the main group. The first of these was started at the Cathcart Home in Devon, later ones at Wayne Presbyterian Church, St. Katharine’s Church, Wayne Methodist Church, the George W. Childs Library (of Wayne), Devon Manor School and Strafford Grammar School, in addition to groups from Mount Pleasant and from the Miller Memorial. All these small organizations combined their efforts with those of the Wayne Branch of the American Red Cross to meet the emergency demand or World War I. 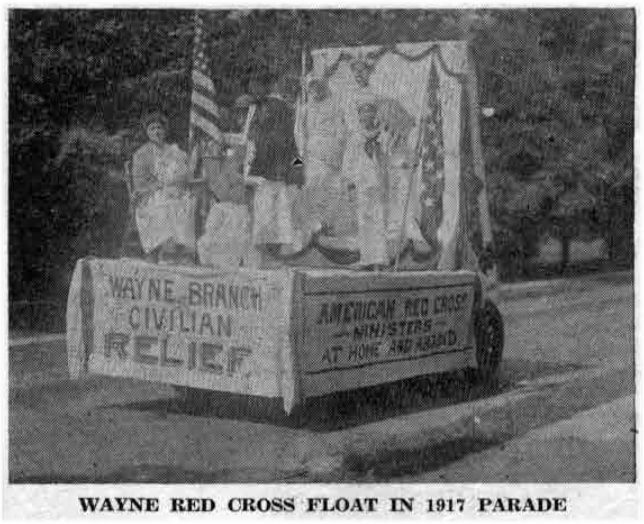 Last week’s column of “Your Town and My Town” described Wayne’s participation in a tremendous Red Cross parade that took place in Philadelphia on June 22, 1917, as part of the “whirlwind campaign” to raise three million dollars for American Red Cross work overseas. Illustrating the column was a picture of one of the Wayne floats used in the parade. A picture of the other float is shown with today’s column. 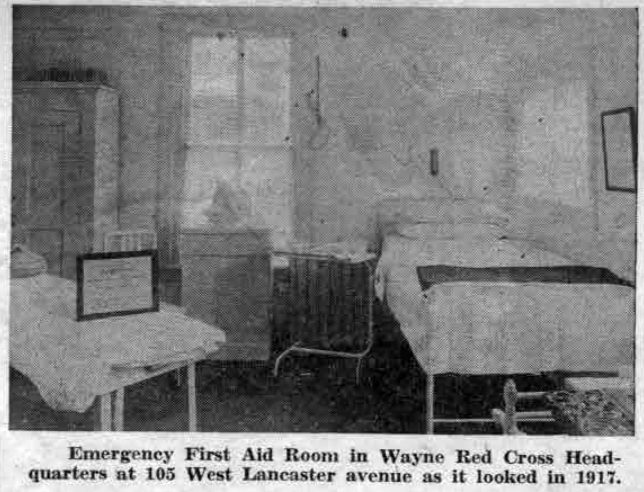 According to the graphic description in “The Suburban” of June 29, 1917, this second float illustrated the practical work of the Wayne First Aid room, the pioneer one to be established along the Main Line under Red cross auspices. This room was in the Headquarters at 105 West Lancaster avenue in the house that once stood on the site of the Anthony Wayne Theatre. A replica of the room was produced for the float shown above. The scene depicted is one that might have taken place following a “reckless joyride” along Lancaster avenue. “The awful example” of the consequences of such a ride is depicted by Mrs. Charles Beatty, who lies on the cot which is almost hidden in the picture by Red Cross nurse Mrs. F.B. Embick. She is helping “Doctor” Lloyd Roberts who is patching up the patient in various places. Standing at the side of the young victim’s cot is his “badly shaken up mother who fortunately seems to have escaped any other damage in the ‘accident’ ”, to quote from “The Suburban” story. In this case the mother was Mrs. Robert Wilson. The picture was obviously taken in Wayne while the tableau for the float was in rehearsal, as is indicated by the large shade-trees and the hedge. The two small boys standing on the sidewalk have been identified by Miss Roberts as her nephews, William E. Roberts and J. Shipley Troth. It is interesting to note that Mr. Roberts, the “doctor,” left within a short time to go to the U.S. Base Hospital in Nantes, France, where he served as a volunteer for some time. 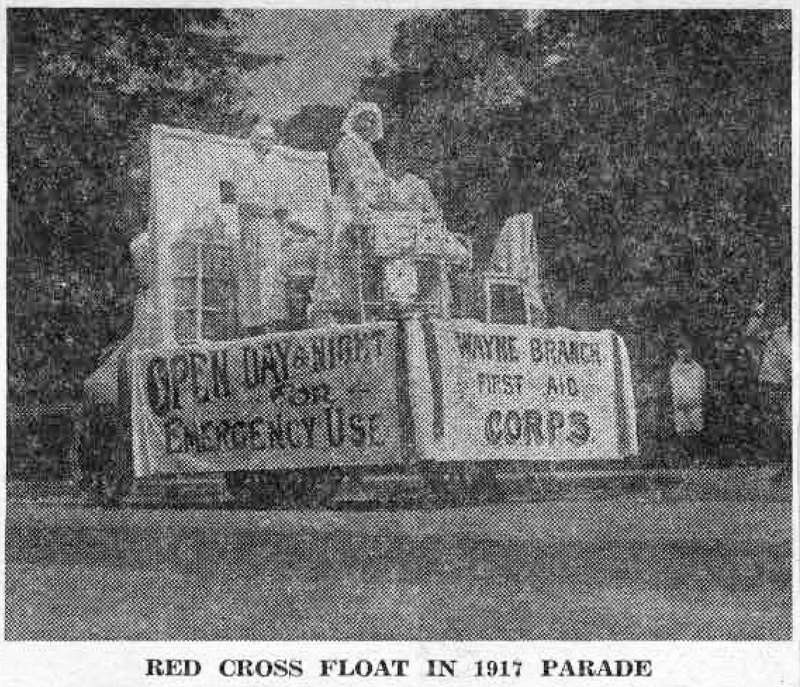 “As ‘The Parade,’ it will be known for many a long year after this war is over, when women of the Wayne Branch shall look back with pride and satisfaction to the part they took in the Great War for Country and for the Red Cross. The picture shown here will bring back to many an old time resident of Radnor township long forgotten memories of a day in June, 1917, when members of the then newly formed Wayne Branch of the American Red Cross participated in a tremendous parade in Philadelphia. This parade was part of a “whirlwind campaign” to raise three million dollars for American Red Cross work overseas, during the early days of World War I. Representing Wayne in this parade were those who marched and those who rode on the two floats. Pictures have been carefully preserved by Miss Grace Roberts, who was one of the marchers. The 9:57 train from Wayne conveyed participants in the parade to Philadelphia, where they mobilized on Spring Garden street near Broad. Marchers and floats together formed a moving group four solid blocks long as they made their way along Broad street to Rittenhouse Square, where a tremendous Red Cross rally was held. As described in the columns of “The Suburban” of June 29, 1917, the Wayne float pictured at the head of the column “bore two groups, one allegorical, representing America extending liberty and aid to the world through the Army, Navy and Red Cross, while the other group illustrates Red Cross Social Service. The allegorical group was made up of Miss Gladys Lawton as Columbia, with her liberty staff and her shield; Miss Neail Randall as the Red Cross carrying its banner; Master John Johnson in khaki with the national flag representing the Army, and Master Thomas Willey in white naval uniform carrying the Union Jack, representing the Navy. Early Friday morning, June 22, the arrangement for this float, like the one to be shown in next week’s column, were prepared in Wayne under “the enthusiastic and indefatigable supervision of Mrs. Robert G. Wilson.” After the rehearsals for position in the tableaux, participants proceeded by train to Philadelphia, while the floats made their way along Lancaster pike. In going through the files at the present Wayne Red Cross headquarters, located in the Masonic building on South Wayne avenue, the writer found some old pictures that would not be recognized by the present generation of Red Cross workers. It is a different story for Miss Grace Roberts, whose service goes back to the summer of 1916. To her, the picture in last week’s column brought back memories of the first permanent headquarters at 105 West Lancaster avenue, and the picture shown with today’s column will be equally familiar. In the room shown above, Miss Roberts spent much time during the years of World War I, making the wide variety of dressings to be sent to Army hospitals overseas by the American Red Cross. In contrast to the output of the present surgical dressings group, which is limited to the making or 4½ x 4½” gauze pads, the variety of dressings made from 1916 to 1918 was extensive. 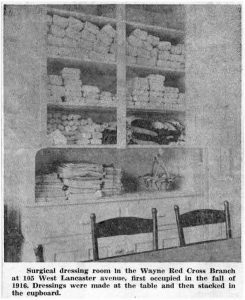 Under the joint chairmanship of Mrs. WillIam Allen Barr and Mrs. William Henry Roberts, Jr., the Wayne group was then preparing such articles as T-bandages, tourniquets, slings, gauze compresses, laboratory pads and head bandages, all to be sent overseas. The packing was fully as important and time consuming. Huge wooden boxes were sent out from Chapter Headquarters in Philadelphia, and Miss Roberts recalls that much of their packing took place in the spacious front hall of her family home on Windermere avenue, with the committee of four often working until midnight. Albert Nichols, son of Mrs. William A. Nichols, one of the founding members, was chairman of the committee. Miss Roberts kept all the records of the work. Worked like Trojans all during the war. They worked every minute with all their might. Was composed of two men, two women, no more. While the other three members helped make the thing go.